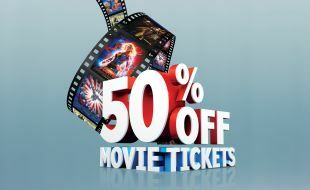 Get 50% off your movies@ ticket! Offer valid from 15 March - 9 May 2019. Your favourite movie promotion is back from 15 March 2019. At Silverstar we make you find a reason to see the latest Blockbusters. Enjoy a 50% discount on all movies – this means adults pay just R32 (2D) or R37 (3D), while kids under 18 pay just R27 (2D) and R32 (3D). Get 50% off any movie, any time, any day!